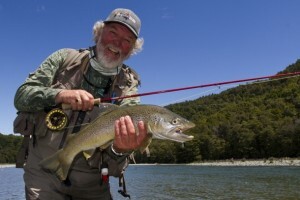 Come and meet Peter Morse, International Federation of Fly Fishers Master Caster Instructor (MCI), and television presenter, photographer and author. Peter will be in store at the Alpine Angler on the 13th of February from 10am to 3pm. This is also an opportunity for a free casting lesson from a highly regarded casting instructor. Peter is also one of only a handful of ambassadors for Sage and Rio so it's also an opportunity to try a range of the latest rods from Sage, and fly lines from Rio because he'll have a bunch of them with him. It's also an opportunity to pick the brains of one of the country's most diversely experienced fly fishermen. Peter from Braemar with a report of last week’s activity here at Braemar. Well not a lot of fishing was done due to the severe thunderstorms and heavy rain that persisted for most of the week, however when there were breaks in the weather some groups did very well and others were left fishless, Bob Cameron and his son did extra well with mudeyes on 2 very early morning sessions catching 11 fish in a couple of hours with the trusty bubble float method slow drifting across weed beds, some very nice rainbows were amongst the catch as well as a few smaller fish that were released. The trolling once again proved to be a bit tough for most people, the O’Hara clan from Torrens had a couple of good sessions with Kimberly and Vicki outshining Glen once more, Charlie White and his son Chris from Melbourne did OK on their first trip out boating with 6 nice rainbows trolling the ever reliable #28 and # 67 tassies, their next 2 sessions provided no fish at all so this gives you an indication on how inconsistent trolling is right now. Jessie Magauer caught a couple of nice pan sized Brown’s and Rainbow’s casting soft plastics from the bank and the boat which has proved to be a very effective method in recent times amongst the heavily timbered area’s, the flyfishing remains up and down, ealy morning dry fly combinations of “parachute” and a small nymph accounted for a few fish for Bernard Willis with 1 rainbow going 1355gms but once again results were very sparse. Tony Fubelli got the occassional Brown and Rainbow casting lures from the banks at Braemar and the spillway but again there were long periods of no activity at all, generally the fishing remains very much up and down, the falling water levels seem to have really upset feeding habits, we expect that to change for the better once the grasshoppers appear from early February so the flyfishing should improve. Braemar is running specials on accomadation for February with deals on houses and cabins during the whole month, stay 5 days and pay only for 4 potentially saving up to $200, just call Peter on 0264568805 and book as soon as you can.